In case you missed the updates, we have had contact from several people about Pat Whalley's article on Bullock Clockmakers of Bath and Box. Obviously, each person is immensely proud of their possession but the following contribution from Kevin Taylor of Frome seemed special to us. 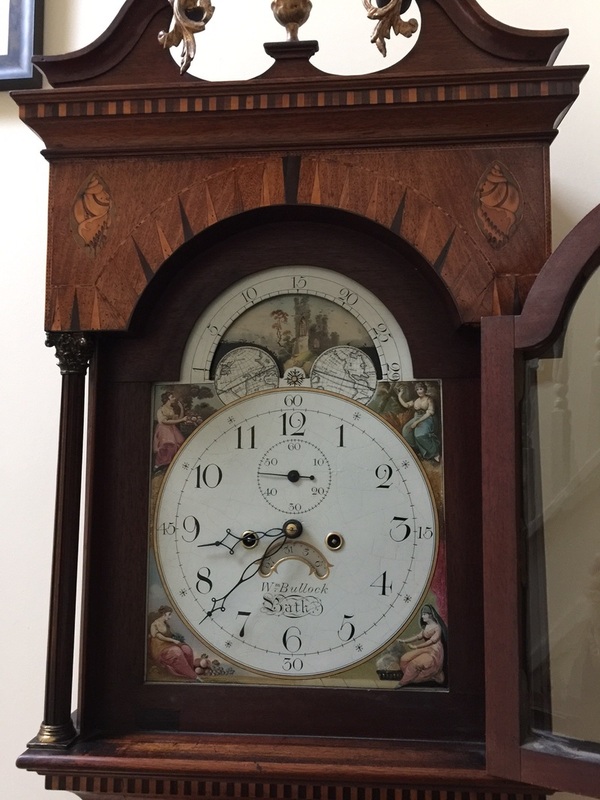 I have just read your article on the Bullock family and found it very interesting as I also own a Bullock longcase clock. Mine is by William Bullock of Bath who was the son of Thomas. My clock has a beautiful inlaid case with a painted dial showing the girls of the four seasons. Anyone wishing to dispute our claim of greatness (not Kevin's) is welcome to contact us with photos and details of their pride and joy. I attach photos of my clock including a picture of the information of the clock's history which is stuck to the back board inside the clock. I acquired the clock from Somerset Clocks, a dealer in Binegar, Shepton Mallet some five or six years ago. The clock stands 7ft 10ins in height. 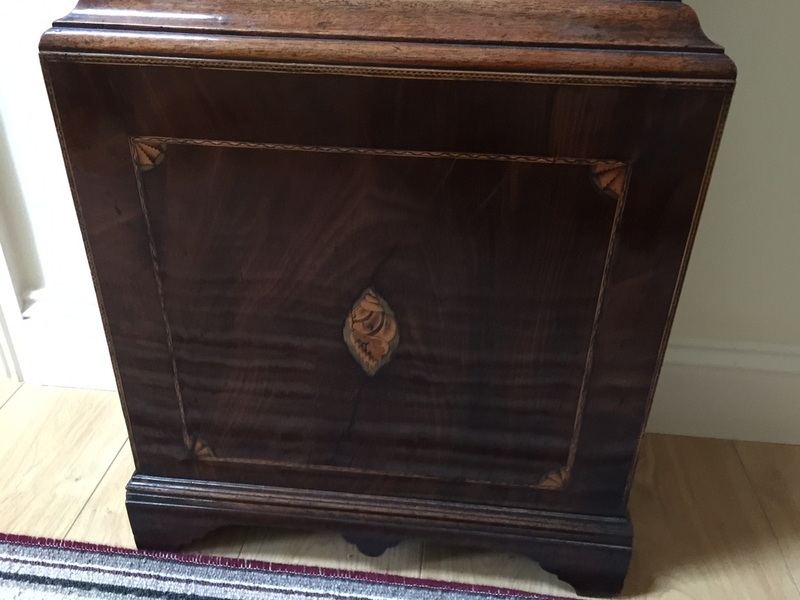 I hope the pictures do the clock justice as the inlay is staggering. 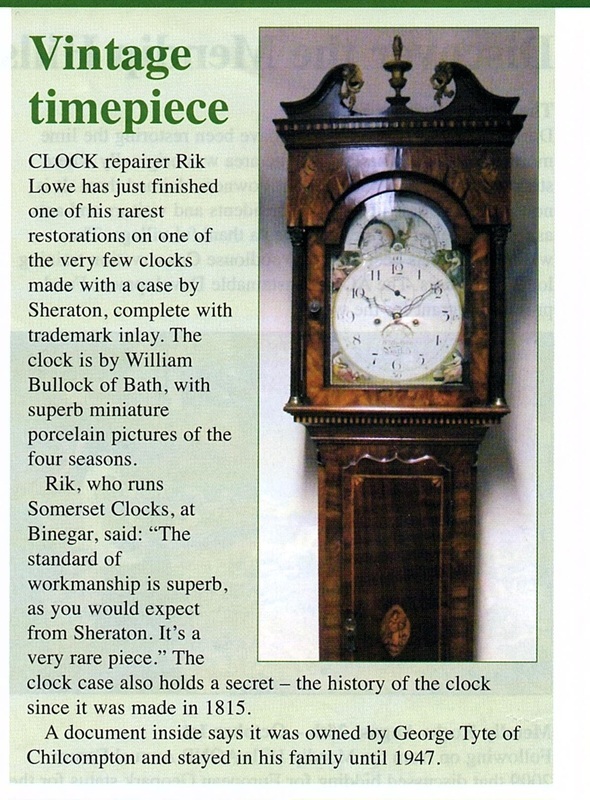 I saw the the article (below left) by Somerset Clocks the Mendip Times listing it for sale and I took a shine to it. 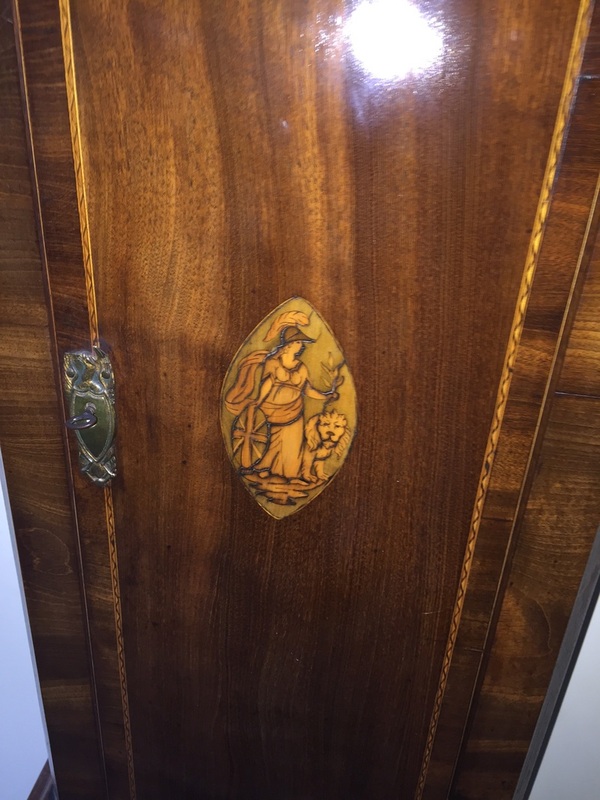 This beautiful specimen of the Cabinet-makers' art was made by Sheraton at the time the Treaty of 1815 (Treaty of Utrech bringing the Napoleonic Wars to an end) was framed which explains the appearance on the door of Britannia with an olive branch in her hand supported by the lion and shield. The four seasons on the face and the views revealed as the moon revolves are all hand painted. 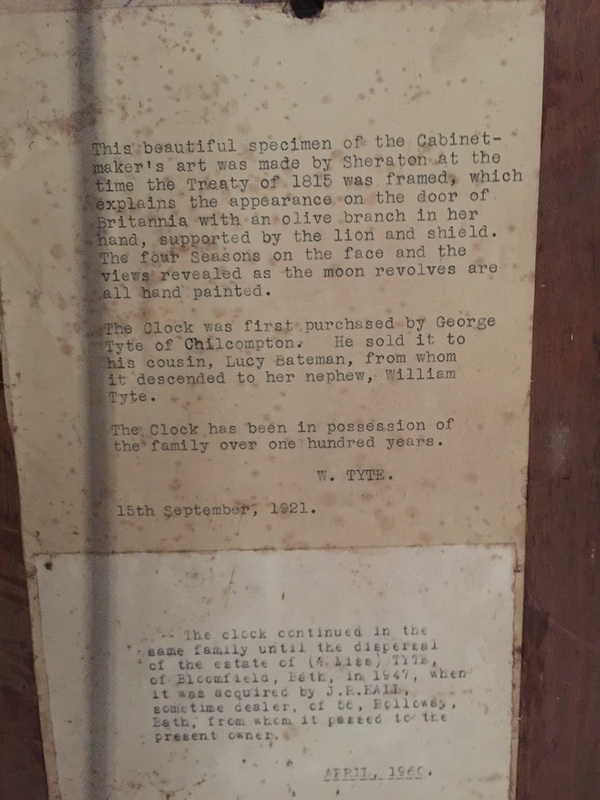 Liz Alexander wrote to us from Australia telling us that they were about to sell the clock which had almost become a family member. She wanted to commemorate her clock. I wanted to reach out to the author Pat Whalley to thank her for her article about Bullock clocks. 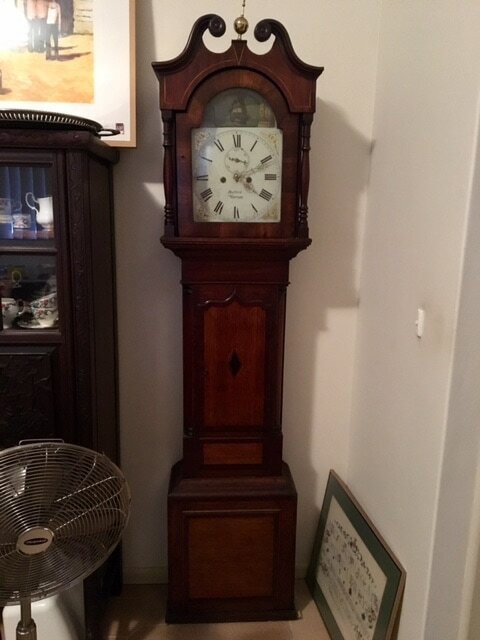 My family in Sydney, Australia, have owned a Bullock clock for many years. My father remembers buying it in England and shipping it down from London. 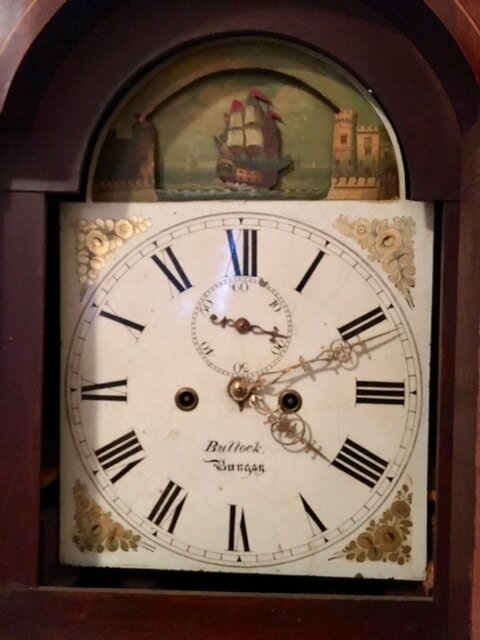 I have been told by a clock maker it looks to be around 1840, based on the Welsh longcase design. It has a lovely ship's movement. It will be passing out of our possession soon, but it's a most really lovely clock. We look forward to any further contributions to the extend the story of these magnificent clocks.